Instagram appears to be testing a new trackbar for fast-forwarding auto-play videos, according to regular leaker @wongmjane. The social media platform is largely used to share photos and short videos (up to one minute), but the experience of navigating the latter isn't as intuitive as it could be. While scrolling through your Instagram feed, videos will automatically start playing, but reset to the beginning if you scroll away and return to them. A new trackbar would let you choose the part of the video you wanted to view, much like the bar on YouTube videos. 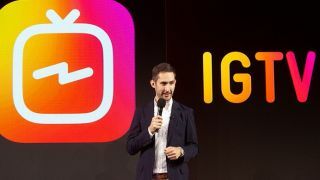 Naturally you won't be able to magically fast-forward live IGTV videos – that would involve time travel – but the new feature would help to remove obstacles for users wanting to skip introductions or avoid rewatching the same content. As social media users find themselves stretched thin across various apps and platforms like Instagram, Facebook, Twitter, Snapchat, it's no surprise that users are hungry for ways to make their app usage more efficient. Instagram has been tackling this with the ability to post to multiple accounts at once, and even a Checkout feature for speedy in-app buying. Users can also track their average usage in the past seven days by heading to the Activity section of their Account page – much like YouTube's 'time watched' stats. Ultimately these platforms want you to spend as much time with them as possible, so any measures that help you stay on top of your usage are to be welcomed.